Sunflowers | Our Farm by Earth Flora Inc.
Sure, wild sunflowers are pretty to look at, but these pretty yellows that look up to the sun are often regarded as weeds or as a menace. They grow everywhere, in hedges, at your backyard, along roadsides. Some farmers slash and burn them! Well, at least some farmers. But let us tell you our little secret. Sunflowers can be your farm’s best friend. Our farm uses wild sunflowers as a major source of nutrients for our compost heap. The stems, leaves and pollen of these flowers are said to contain phosphorus, potassium, calcium and magnesium. These nutrients can go a long way, especially when your soil has become depleted. We usually harvest the young stems of sunflowers (which easily decompose) and include it in our compost. One hectare of wild sunflowers can easily produce up to 50-60 tons of mulch for our compost, every 60 days. Wild sunflowers are not only used as compost but as mulch for our flower beds as well. We incorporate the sunflowers and its foliage in our flower beds during cultivation stage. Aside from these, you can cut the plants, soak it in water and make tea fertilizer for your crops. Also, these dainty flowers attract bees! And if there was one thing our garden needs, it’s the bees, which come and pollinate our other crops. The sunflowers also attract lady beetles and wasps, beneficial insects that help us get rid of pests around the farm. The bugs and wasps make their homes in the sunflowers, sort of like a free bed and breakfast for our little helpers. Wild sunflowers can be a huge help in pest control. We never run out of uses for our sunflowers, they are also used as hedges, to control erosion and at the same time serve as a wind break for our crops. Sunflowers are easy to grow. They can be easily propagated, and can grow faster than any other weed. You have a wealth of sunflowers everywhere. And they are quite a pretty sight! 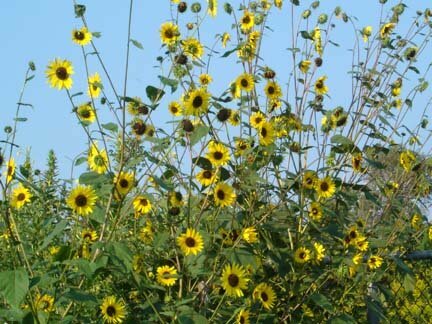 Once thought of as an eyesore, a pest, and as a menace, we have since then recognized the many uses of wild sunflowers. Since we begun using these flowers, we have seen our soil’s nutrition and structure improve (well, also because of the other practices we have on the farm.) We also have seen reduction in soil erosion and in pests. I would have to say, wild sunflowers are another one of life’s paradoxes. Often, a foe, is really a friend, you just have to find the alchemy of it all.